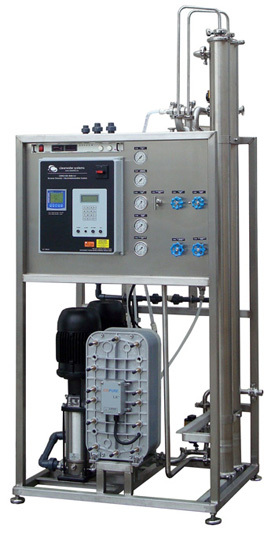 Ultrapure Water, typically >16 MΩ produced on a single skid incorporating Reverse Osmosis and Electrodeionization by Ionpure. IonpureCDI electrodeionization module with proven reliability. Product water divert valve activated upon system startup to flush pure water lines and assure best quality water. HMI Display for water quality, flow measurement, operating status and alarms. Isolation/Divert valves to facilitate optimum RO membrane / EDI module cleaning and sanitization. Stainless steel multi-stage centrifugal pumps. Ultrapure water with resistivity up to 16 MΩ ideal for USP and reagent uses. Compact design requires only 0.85 m2 of floor space. Available in Series V configuration for validated applications. Dependable operation with virtually no operator involvement. Energy efficient low pressure design. 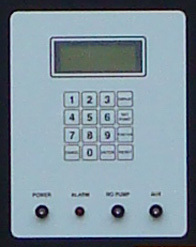 Integrated back-up pump and controls.